Many acres of pasture land were flooded in 2017. The extent of damage depends on many variables. In 1990, I had to leave college early to help my family load all of our belongings onto hay trucks and gooseneck trailers because the Army Corps of Engineers warned us the Red River was going to crest at a level that would have flooded our home. Our belongings were stored in neighbors’ barns around the county. My dad drove our fishing boat over pasture fences, past our flooded center pivot towers to the main channel of the river where we watched as large hardwood trees were swept by in the current, tumbling end over end. First you’d see the enormous rootball, then after a few seconds the top of the tree. During that flood, the river cut into our farm and we lost acres. Farmers and ranchers with bottomland understand the river is a blessing and a curse. The soil is deep and rich, but on occasion the river will turn on you. 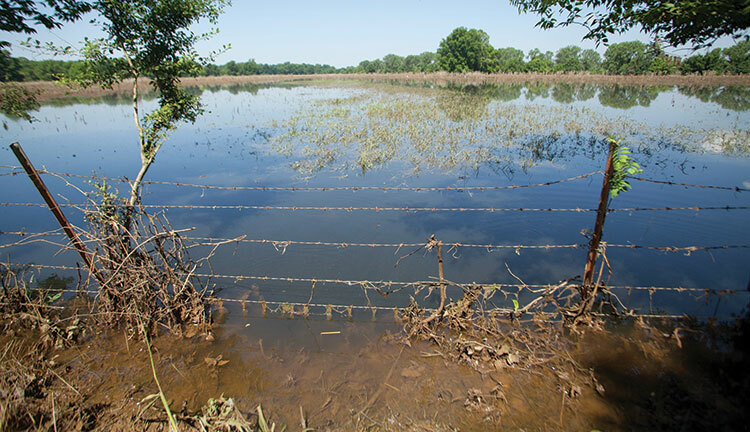 In May of this year, almost 1 million acres of farmland were under water in Arkansas; 21 of 75 counties were listed as suffering storm damage. The loss to cropland was devastating and was the focus of most of the media attention. But it stands to reason that pastures were flooded, too; however, the number of pasture and hay acres that were flooded and the economic impact of those is nearly impossible to calculate based on lack of available data. The extent of flood damage to pastures is dependent on several variables: forage species, season of flooding, and duration of submersion. Dormant plants suffer less damage from flooding, and survivability improves when temperatures are lower. Grasses have reportedly survived 60 days of submersion with cooler temperatures, whereas the same plants can be killed within 24 hours of submersion with water temperatures over 85°F. Alfalfa can be submerged for seven to 10 days when dormant, however only three to four days when actively growing. 1. Check fields and remove debris that could cause harm to livestock or damage equipment. 2. Assess silt, gravel, and sand deposits. 3. Repair damage to fences, gates, and other infrastructure. 4. Assess forage condition by checking plants for root damage. Jim Alford, a cattleman in southwest Arkansas, owns land along the Red River and is well versed in recovering pastures after flooding. In 2015, the Red River left its banks twice, once in May and again in December. Alford said, “There’s always lots of sedimentation, fences wiped out, and big timber deposited in pastures. We usually get sand dumped on us, it can be 2 to 5 feet deep in places and in the beginning nothing will grow. Eventually, bermudagrass will come. We feed cattle in those spots to increase organic matter. “One advantage to the sand is it doesn’t get muddy and you can drive on it. We also move excess sand into our lots or areas where it’s needed. Ideally, you could sell the extra sand, but nobody has come along and offered to buy it off me yet,” Alford said with a chuckle. Alford has put in levies and culverts with flaps in low areas, but in 2015 all of those got washed away in the floodwaters. Wren had damaged fences, but the worst part of flood recovery for him was removal of debris. Once he had the debris cleaned up and the soil dried out enough, he disked the sediment into the soil. Eventually, Wren actually had a good cool-season annual crop for his rotational grazing system. With the loss of grazeable acres, Wren had to ship yearlings out to the feed- yard at lighter weights. This proved to be a major inconvenience as the ground was too wet for semis. They had to use goosenecks to move the calves to the headquarters and then load them onto the semitrailers. Wren said, from his point of view, he was luckier than most as the river didn’t leave him with beach sand, which can cut a farm in two. He knows of one ranch near Foreman, Ark., where 300 to 400 acres are now in the middle of the river where it cut them off from the rest of the ranch. Producers along rivers know it’s not a question of if the river will flood them, but more a question of when. Experienced producers know when to move equipment and livestock to protect them from the flood and what to expect after the waters recede; but they also know the river is unpredictable and can still surprise them given the right weather conditions. This article appeared in the November 2017 issue of Hay & Forage Grower on pages 16 and 17.